For most Filipinos, the highlight of every afternoon is undoubtedly merienda. A quick mid-afternoon snack gives a much-needed boost against the usual midday slump. One of the favorite merienda snacks is the ensaimada – sweet buns coated with butter and sprinkled with sugar and grated cheese. Among different variants of this classic treat, the Red Ribbon Cheesy Ensaimada is definitely a favorite enjoyed anywhere, from homes and schools to workplaces, best paired with beverages like coffee or hot chocolate. 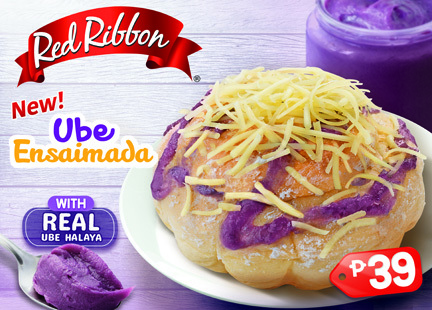 Bite into the deliciously cheesy, ube goodness of Red Ribbon Ube Ensaimada. Grab it for only P39 or bring home a 4-piece pack for only P150. Drop by your nearest Red Ribbon Bakeshop today or visit www.facebook.com/redribbonbakeshop/ to check out other great-tasting goodies.